Line, shade, whatever you wish with NYC NEW YORK COLOR Smooth Mineral Kit Eyeliner/Eyeshadow ($7 @ Walgreens stores) from the Electric Avenue Fall/Winter 2007. 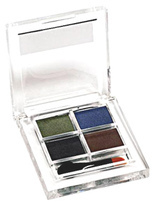 It’s a 2 ¼” x 2 ¼” Lucite quad with four build-able basic dark mineral colors inside. Use a wet or dry brush to create a unique look. If you haven’t tried minerals yet, what are you waiting for?